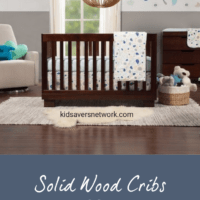 Babies and parents love solid wood cribs. Not only do they look absolutely gorgeous, they’re also resilient and strong. Unfortunately, they tend to be a bit on the pricey side. 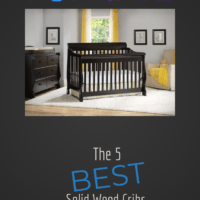 The good news is we can help you find the best wood crib for you and your budget! 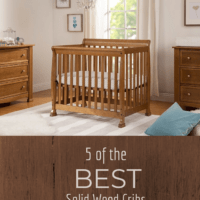 American Made Solid Wood Cribs? A wooden crib is easy to clean, eco-friendly and a worthy investment. They’re also very durable and sturdy. You can use them for more than one baby and they’ll still look great. With a wooden crib, you don’t need to worry about dangerous plastics and toxins, either. Whichever design you purchase, you’ll want to know it’s safe, durable and fits in perfectly with your nursery. 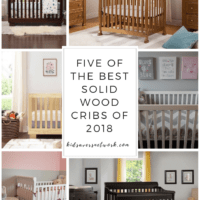 We have reviewed five of the best wood cribs on the market to help you find one that ticks all the boxes. The Storkcraft Calabria is very well made, sturdy and is beautifully stained. It’s a convertible crib with a combination changing station that is attached right next to it. This helps save on space if the nursery room is limited. Not only does this model transition to a toddler bed and then to a full-size bed, the changing station converts too. It can also be converted to a nightstand or a dresser. You may find the changing pad that comes with the changing station is a bit too thin. It might be best to purchase something thicker to replace it. The changing station is on the smaller side too. It will last until your baby is an older toddler (but hopefully they’re out of nappies by then!). The Babyletto Modo is perfect if you’re looking for a classic wooden crib design. It’s very sleek and does not take up that much space in the nursery. If you are looking for a space saving crib, this could be the one for you. This wooden crib is made out of New Zealand Pine. It’s a convertible, so it will be able to grow with your little one. It has 4 adjustable mattress levels and it comes with a toddler rail. All of the Babyletto Modo’s hardware is hidden away so you don’t have to worry about your child finding it. The biggest drawback of this crib is that it does scratch easily. 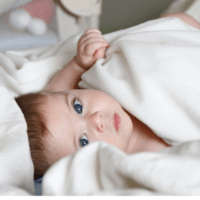 While this may not be an issue when your baby is an infant, you do want to take proper precautions such as a teething pad to put on the top crib rail. The other complaint is that the toddler rail leaves a bit of a gap between the bases of the bed. The Babyletto Modo is available in five colors including “Expresso” and white. The Delta Canton has a beautifully design and a gorgeous wood finish. It can support your little one through all stages of childhood. This convertible crib transforms from a crib to a toddler bed and then finally into a full-size bed. The bed also has a headboard and footboard so you’re sure to get a lot of use from the Delta Canton. The Delta Canto is made from solid pine. It not only looks sleek and classic, but it is also easy to clean. It is made entirely out of solid hardwood and not MDF or particle board. So, if it does get scratched up you can easily refinish the wood to make it look brand new again. One complaint of this wooden crib is it does show its hardware. It is visible on the front and on the sides of the crib. It is also a bit difficult to assemble as its parts are not properly labeled. There is a different between right and left sides so it is best to be careful when assembling. 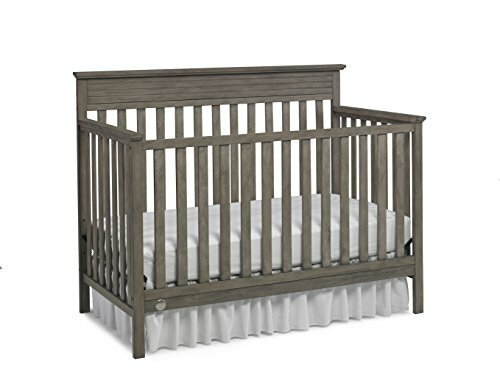 In conclusion, the Delta Canton is a luxurious looking wooden crib that will last for years. 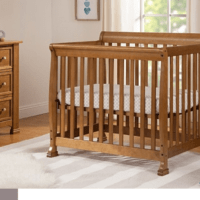 The Davinci Kalani is a top-rated convertible crib with a lower profile. This makes it easy for you to reach your little one. This is especially helpful for new mothers who aren’t especially tall or are recovering from CS deliveries. This wood crib converts easily to a toddler bed, daybed and to a full-size bed. Another great feature is that it uses mattress springs instead of MDF panels or slats which can slip and slide around. When assembled it is very heavy and sturdy, though not heavy enough where you couldn’t move it in different areas of the room. It’s finished in a non-toxic, multi-step painting process. It’s nice to relax knowing the crib is a safe environment our little ones. Like many wooden cribs, the Davinci Kalani crib does scratch easily. You need to make sure you have proper protection before your baby begins teething. A teething pad on the top would do the trick. While this crib is beautifully crafted, it is a bit tricky to assemble. 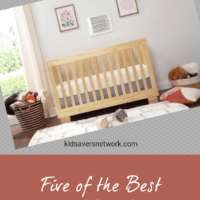 Overall, the Davinici Kalani is a great wooden crib that offers value for money. Click here to check out the latest price on Amazon. The Fisher-Price Georgetown crib is handcrafted in beautiful New Zealand pine wood. It comes in three colors: white, gray and espresso. You can also have a personalized name plaque with your baby’s name on it that you can hold onto as a keepsake for the rest of their lives. This is a really nice touch. To be honest, you wouldn’t expect it for the low price this model is available for. This crib is very easy to assemble. All of the parts come labeled so that you always know whether or not you have the correct piece. The side rails are fixed and the design makes it very sturdy. It can convert from a crib to a toddler bed, daybed and then to a full-size bed. However, you do have to pay for the conversion kit separately. The good news is that it is widely available at any big box retailer. Another drawback is that while most cribs have a 4 position mattress platform, the Fisher-Price Georgetown only has a 3 position mattress platform. On the plus side, this is one of the cheapest wooden cribs on the market today, so deserves to be on our list. A question many of us parents ask is “Where are the American Made Wooden Cribs?”. Sadly, you’ll find that 99% of the cribs for sale in the USA are actually made in Asia. Some crib manufacturers like “Young American” tried to reverse the trend, but ultimately failed. 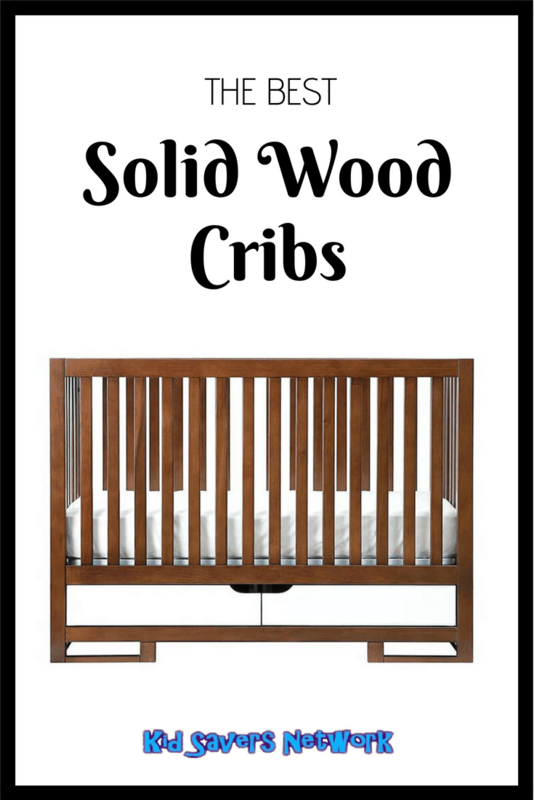 You can find some wooden cribs that are still made in the USA on our page “Solid Wood Cribs Made in the USA”. You should also take a look at the baby pillows that won’t give your child flat head.